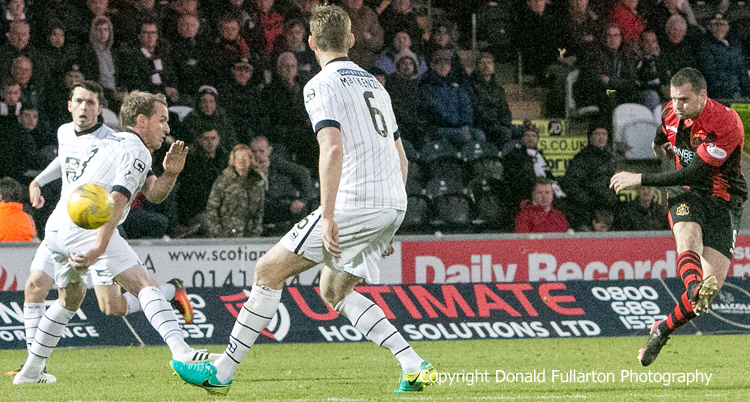 DUMBARTON'S wait of almost a year for an away victory ended in Paisley with a 1-0 win over St Mirren. DUMBARTON'S wait of almost a year for an away victory ended in Paisley with a 1-0 win over St Mirren in front of a 2,750 crowd. At the kick-offr Sons had not won away from home for 335 days, while St Mirren were still winless in the Ladbrokes Championship this season. For a long time it looked like a draw and no change to either side's record. However Garry Fleming's 63rd minute goal gave Sons that much sought after away win in a 5th November clash with very few other fireworks. A tepid first half which yielded no goals and very little action made way for a slightly better second period in which St Mirren had more possession. But then came an extraordinary blunder from home keeper Jamie Langfield when he misdirected a pass to one of his defenders, Joe Thomson intercepted it and then rolled the ball across for the inrushing Fleming to convert an easy tap-in. Saints came close to grabbing an equaliser on 79 minutes when a flashing header scraped the crossbar with Alan Martin beaten, and the cross bar rescued Sons again on 87 minutes as the Paisley team piled on the pressure. However Sons resolute defending, with Martin in top form, made sure of a priceless three points. The picture shows Fleming firing in a late shot, but it was saved by Langfield.